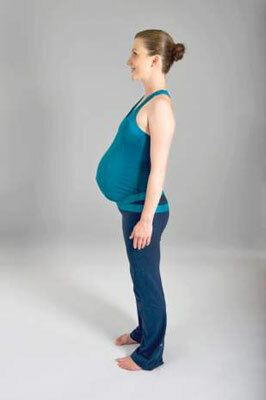 One of the benefits of the mountain posture during pregnancy is that it directs your attention to your posture during this period when your weight and balance have gradually but steadily changed. After you find your center of balance, begin the process of making a mental shift, using the breathing style of your choice. Stay in mountain posture for 6 to 8 breaths. As its name suggests, warrior I strengthens the legs and improves stamina and balance. 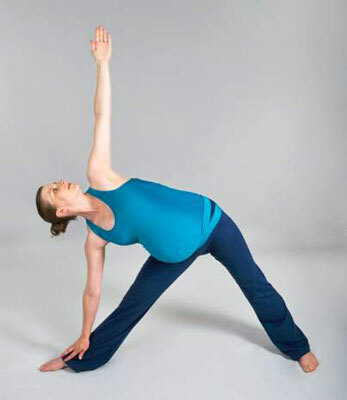 It’s especially beneficial during pregnancy because it stretches your hips and helps with tension in your neck and swelling in your fingers. Move into and out of the posture three to four times, and then stay for 6 to 8 breaths on each side. Another variation in the warrior family, this powerful posture opens your hips as it builds stamina and strengthens your arms. Move into and out of the posture three to four times, and then stay for 6 to 8 breaths on each side. This modified forward bend improves circulation in the head and lengthens the spine, hamstrings, and adductor muscles on the inside of the thighs. Just hang in this posture for 6 to 8 breaths. You can also try this standing posture with your hips at a wall or door. The triangle posture stretches the sides of the spine, the back of the legs, and the hips while it opens the chest. Move into and out of the posture three to four times, and then stay for 6 to 8 breaths on each side. The supported chair squatting posture builds overall stamina while it strengthens your back, legs, shoulders, and arms. Move into and out of the posture three to four times, and then stay for 6 to 8 breaths. Use an actual chair unless you feel comfortable without it. Use a wide stance to maintain your center of balance. This posture is a wonderfully relaxing way to end this short routine. Use an advanced breathing technique that doesn’t require breath retention, such as alternate nostril breathing, and/or a meditation technique.